ww2dbaseClarence Leonard Tinker was born near Pawhuska, Oklahoma, United States in the territory of the Osage Nation to father George E. Tinker and mother Sarah A. Schwagerte; he was one eighth Native American. He worked in his father's print shop for the Wah-Sha-She newspaper, which his father founded. In 1900, he attended the Haskell Institute, a Native American school in Lawrence, Kansas, United States, but he did not complete his studies. In 1906, he enrolled in the Wentworth Military Academy in Lexington, Missouri, United States, graduating in 1908. He was assigned to the Philippine Constabulary. In Mar 1912, he was commissioned a lieutenant in the US Army and served with the 25th Infantry Division at Fort George Wright in Spokane, Washington, United States. 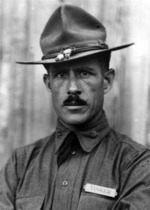 During WW1, he remained in the United States, serving in the southwestern region of the country. In 1919, he began flying lessons, and soon transferred to the Army Air Service. On 1 Jul 1922, he became a pilot. In 1927, he was named the Commandant of the Air Service Advanced Flying School at Kelly Field, Texas, United States. On 15 Nov 1930, he was named the commanding officer of the newly formed 20th Pursuit Group based at Mather Airfield, Sacramento, California, United States. In Oct 1932, he became the commanding officer of the 17th Pursuit Group based in March Field, Riverside, California. In Dec 1935, he transitioned into a bomber commander, heading up the 7th Bombardment Group. In 1938, he left the 7th Bombardment Group and went to Washington, DC for administrative duties. In Mar 1940, he became the commanding officer of the Southeast Air Base in Tampa, Florida, United States. On 1 Oct 1940, he was promoted to the rank of brigadier general. In Jan 1941, he became the commanding officer of the 3rd Bombardment Wing. On 6 Nov 1941, he took charge of the 3rd Fighter Command. ww2dbaseUpon the United States' entry into WW2 in Dec 1941, Tinker was named the Commander of the Air Forces in the Hawaii Islands on 19 Dec. 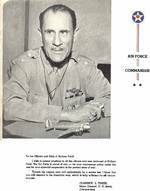 In Jan 1942, he was promoted to the rank of major general, the first Native American to reach the rank. On 5 Jun, he led a group of four B-24 Liberator bombers from Hawaii to Midway. In the evening of 6 Jun, during the Battle of Midway, Tinker personally led a force of B-24 Liberator bombers to either search for Japanese naval vessels or to bomb the Japanese garrison at Wake. His aircraft was last seen spiraling out of control and plunging downwards into thick clouds. The other three bombers attempted to continue on with the mission, but bad weather eventually forced them to abort. When they returned, they found that Tinker's aircraft never returned. The entire crew of eight was never found and presumed dead. Tinker was the first American general to be killed in WW2. He posthumously received the Distinguished Service Medal and had the Oklahoma City Air Depot renamed Tinker Field in his honor. 21 Nov 1887 Clarence Tinker was born near Pawhuska, Oklahoma, United States. 1 Jul 1922 Clarence Tinker was certified a pilot. 15 Nov 1930 Clarence Tinker was named the commanding officer of the newly formed 20th Pursuit Group based at Mather Airfield, Sacramento, California, United States. 1 Oct 1940 Clarence Tinker was promoted to the rank of brigadier general. 6 Nov 1941 Clarence Tinker was named the commanding officer of the US 3rd Fighter Command. 19 Dec 1941 Clarence Tinker was named the Commander of the US Army Air Forces in the Hawaii Islands. 5 Jun 1942 Clarence Tinker led a group of B-24 Liberator bombers from Hawaii Islands to Midway Atoll. 6 Jun 1942 Clarence Tinker led a flight of B-24 Liberator bombers from Midway Atoll. 7 Jun 1942 The B-24 Liberator bomber flown by Clarence Tinker plunged into the Pacific Ocean; no rescue mission was launched, and Tinker and eight other aboard were presumed lost. I had a Veteran who served under General Tinker tell me "Tinker never sent his men into battle he lead them". He was greatly respected and appreciated by his command for his outstanding leadership.